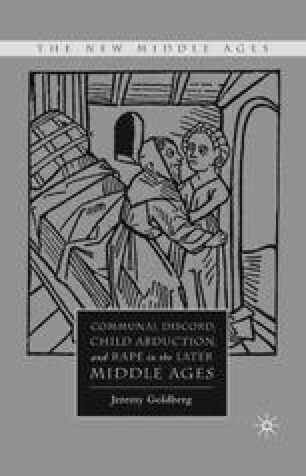 The narrative of Alice de Rouclif’s childhood culminating in her betrothal, her subsequent forced abduction, and lastly the court action that was provoked by her abduction is known to us almost entirely from the surviving court records. These records comprise a variety of documents, but it is the records of the testimony of witnesses that are far and away the most illuminating in trying to recover the experiences and perspectives of those touched by the case or even of the principal parties who by canonical convention did not testify in person. Oral testimony was recorded as written depositions. They record a variety of voices, each with its own story to tell. This chapter is concerned to explore this surprisingly complex process of story telling.